The French artist Rene Magritte worked in the style of impressionism, which is rather difficult for perception of the flow of visual art. In his works, he tried to combine the incompatible, thus expressing his inner world, his vision of events in life. Many of his paintings remained unwritten – they remained in the artist’s mind in the form of formulated concepts. 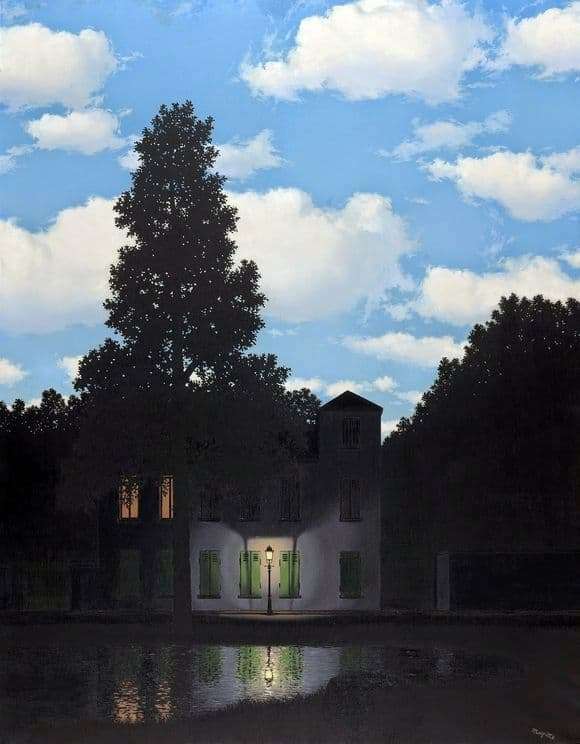 In the world of Rene Magritte there was nothing impossible – the day could peacefully coexist with the night, as in his famous painting “Empire of Light”. At first glance, it depicts the usual, real, such a piece of the urban landscape. A simple two-story house with white walls stands on the shore of a small lake. Its small windows exude warm light, evoking the thought of home comfort and peace. The warm light of a single lantern in front of the entrance is like a beacon for a weary traveler who would really like to stay overnight in this wonderful little house. The house was surrounded by dark trees, safely covering it from storms and winds. Around it is a quiet night. But it is necessary to take your eyes off the house and look above, and what do we see? A piercing blue day sky over which fluffy clouds float! This combination of two incompatible phenomena, day and night, draws the viewer’s attention to this picture. Magritte believed that these nearby phenomena, combined in his picture, represent the magic power of poetry, which surprises and fascinates people. And he was not mistaken – lovers of painting so bewitched his work, that many wanted to have his copy in his collection. Magritte did not refuse anyone – about sixteen versions of the “Empire of Light” are written, written in oils and seven variants of gouache. These paintings are somewhat different from each other in composition, as the customers had their own requirements for what the artist should do. And yet the very first “Empire of Light” is the best among them.